Where to Buy Korean Beauty Products? I’ve always been a lover of Korean cosmetics and with it finally being ‘acknowledged’ by the masses, it makes it so much easier to get a hold of cult and must-try products. It’s still hit and miss sometimes, though over the years, I think I’ve found a great selection of retailers that I trust. Yes, eBay does sort you out most of the time, but I’m always a bit weary of fake products and scam-artists… So, I’ve accumulated a list of shops and sellers that I’ve used, and whom I know sell authentic products. The trusty old pal – SASA – shop here for 3 Concept Eyes, Banila Co, Laneige, Skin Food and Tony Moly. My cousin introduced me to this shop about… 7-8 years ago? (Yes, I fell in love with beauty early). Over the years it’s evolved so much and it now carries so many great brands! It’s basically Hong Kong’s answer to Boots, French pharmacies and Asian drugstore beauty items. It’s literally got everything. Personally, I’m not too fond of how the site looks, it’s a tad too pink and fluffy for me, but it does the job and has competitive priced products. It carries over 50 different cult-Asian brands and definitely subscribe to their bi-weekly newsletter to receive special promos and offers. They ship worldwide and I believe it’s free shipping from $29 onwards most of the time, excluding additional taxes/customs. The cool kid – Wishtrend – shop here for Klairs, COSRX, Mizon, I’m From and C20. 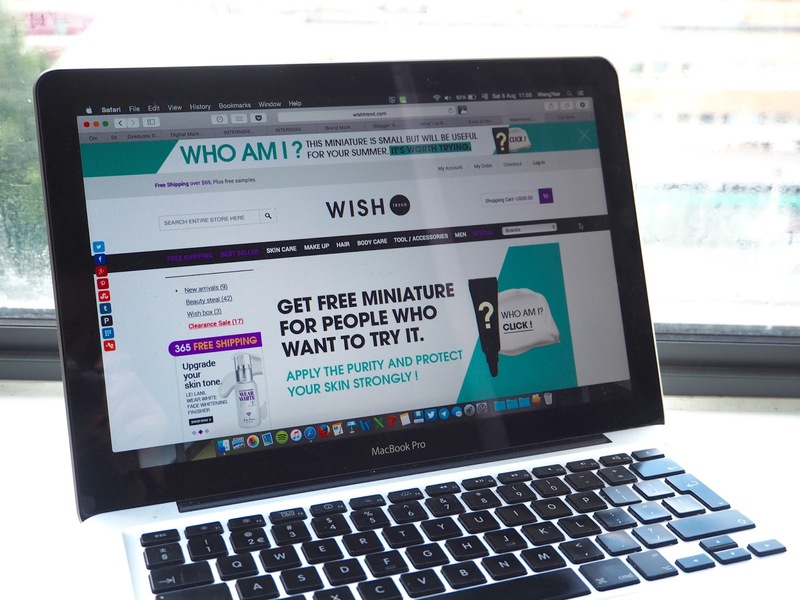 I recently discovered Wishtrend when I was on the hunt for some COSRX products and got reeled in by their other amazing brands. Their YouTube channel is tha bomb if you want to know more about specific Korean beauty products, how they work, what they do and how to get one step closer to that immaculate Korean complexion. If you sign up with the code 316043005, you’ll get $5 off your first order. Buy something from their ‘free shipping zone’, and they’ll ship it to you for free. If you’re unsure what to buy, they do kits for specific skin troubles, which may be a great gift for yourself if you’re sussing out what products to try or to treat a friend. The unexpected choice – Sephora – shop here for Belif, AMOREPACIFIC, Dr. Jart+. I know Sephora may seem like a fish out of the water when talking Korean beauty, but with it becoming a big ‘thing’ in the States, a lot of great brands have made its way across the pond —making it so much more accessible. Boots carries Dr. Jart+ in the UK, though Belif (Korea’s answer to Kiehl’s) and AMOREPACIFIC (think Korean Estée Lauder) are yet to be found in Europe. Yay for finally having international shipping! The trusted eBay sellers – rubyruby76 , bringbringshop , iamlove-shop , jolse_cosmetics – shop here for Lioele, ETUDE HOUSE, GOODAL, Missha, Innisfree and Holika Holika. Me and eBay, we’re in this together. I love eBay for many reasons and I think I’m slightly obsessed with their app, as it’s so easy to use! It’s quite tricky to distinguish the fakes form the real deal, but the listed sellers above have actual webshops (or even physical shops) in Korea and I’ve never had any troubles. Also, they have such a wide range of products, so it’s definitely worth checking out. If you’re doubting whether the seller is authentic, always look at their reviews, when they were established and where they’re based (I’d say Korea would be a safe bet ;-). The ones I haven’t tried yet – Soko Glam and Glow Recipe – shop here for Caolion, Whamisa and SU:M37. Both Soko Glam and Glow Recipe carry brilliant selections of brands and if it were up to me, I’d order anything from the site in a blink of an eye. The only problem is that they currently just ship to the States and Canada. Both sites carry the popular and ‘main’ Korean brands, as well as more niche ones. Though what tickles my interest is that they carry some of the best natural Korean brands out there. Whamisa is edging towards the luxury green beauty tier (I’m eyeing their Kelp Sheet Mask), Caolion’s Blackhead Steam Pore Pack got me curious —I mean… something to steam off your blackheads? Count. Me. In. Oh, and you know… SU:M37 has only blown the beauty world away with their Miracle Rose Cleansing Stick. I’m super guilty for having one!